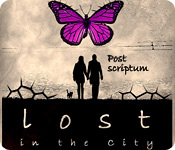 Help Hero and Ann wake up all of mankind in Lost in the City: Post Scriptum! Put an end to the curse and save the entire world! After being the guardians of the future, Hero and Ann are told to leave their city. After returning to the real world, they discover that all of humanity is asleep! Follow the Hidden Objects and make your way through this intriguing story and save the day! While on vacation, you are haunted by the ghost of a poor painter in love with a rich heiress – who was killed at Fairing Point!